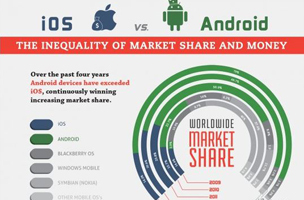 Since 2009, Android has been growing worldwide, but it failed to match the iOS platform as a major source of income. This past holiday season, iOS users were 5 times more likely to purchase online. Further purchases made on iOS came to an average of $93.94 compared to $48.10 of Android transactions. When it comes to the apps marketplace, marketshare doesn’t necessarily equate to profit. Today’s infographic reveal just that. This is also true of apps. We’ve shared a video infographic in the past that showed iOS dominating revenue for app developers: $21276 average revenue per developer on iOS compared to that of $6000 for Android. The unavoidable conclusion here is that Apple has control over that part of the market that is fiscally comfortable with buying things: no doubt this is a profitable fact for them, as it isn’t a far stretch to assume that they also experience high purchases for other Apple products, iTunes store downloads and App store downloads.